Bucharest, Romania – WWF welcomed the second release of five European bisons in Vanatori - Neamt Nature Park, which is the beginning of the reintroduction of the species in the Carpathian Mountains. 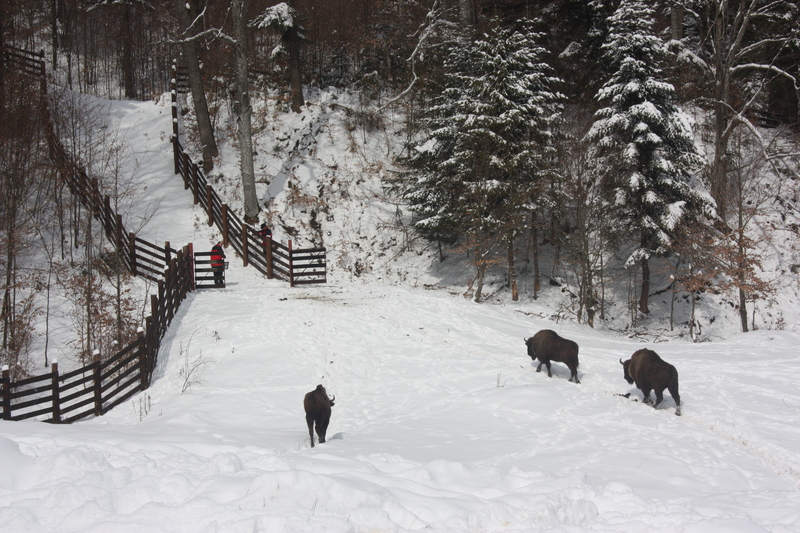 The first group of five bisons was released by the park administration back in March 2012. The released animals are aged between 3 and 7. They have been raised in zoos in Western Europe. The species are monitored by radio collars to obtain data on their new habitats, movements and preferences for refuge. Monitoring of the animals released last year showed that they explored a forest area of about 2,000 ha. Almost 200 years after the European bison disappeared from the Carpathians the first two births at large took place, indicating that the species are adapting well to the environmental conditions of Vanatori - Neamt Nature Park. Meanwhile, the animals are provided with food through special facilities before they find their own way. Experts say that a population of 20-25 bisons must be reintroduced to prove the project viable. ‘WWF was one of the supporters of the reintroduction project in Vanatori – Neamt and is now aiming to replicate the success in a pilot area in the Southern Carpathians, with the help of the Rewilding Europe initiative, which aims to rewild one million hectares of land by 2020, creating 10 wildlife and wilderness areas of international quality, said Adrian Hagatis from WWF, who is in charge of the project in Romania. The initiative is focused on making a viable business case for wild nature in places including the Southern Carpathians and the Danube Delta Biosphere Reserve in Romania. The initiative will create favorable conditions for the return of missing native species including the bison.